How Do I Get Dolphin To Use AMD Radeon 7670m? I'm wanting to know how to use AMD Radeon 7670m instead of Intel HD 4000. It seems Dolphin isn't using it at all. I checked with some program. I don't know if I should post any other info about my lab top. But if it's needed I will. This has become a fairly common issue with the newer 7xxx AMD and 6xx NVIDIA cards. The solution (or weird stop gap until a proper solution can be made) is to go into Graphics > Hacks and slide the tex cache slider to the left until it works. You should post your settings, PC specs, and dolphin revision in case someone else needs them to help you. (10-12-2012, 02:12 PM)Axxer Wrote: The solution (or weird stop gap until a proper solution can be made) is to go into Graphics > Hacks and slide the tex cache slider to the left until it works. That's one guys guess and hasn't been proven. Set the Dolphin.exe to high performance like the shot below. I'm pretty sure several people have done it and reported it working if you go look at the related threads. The driver method should work too though I have seen a number of people do it and get crashes. Just try both and see which one works. I've tried this already. But it still uses Intel HD 4000. I'll try Axxer method soon. And I'll have my specs up soon. 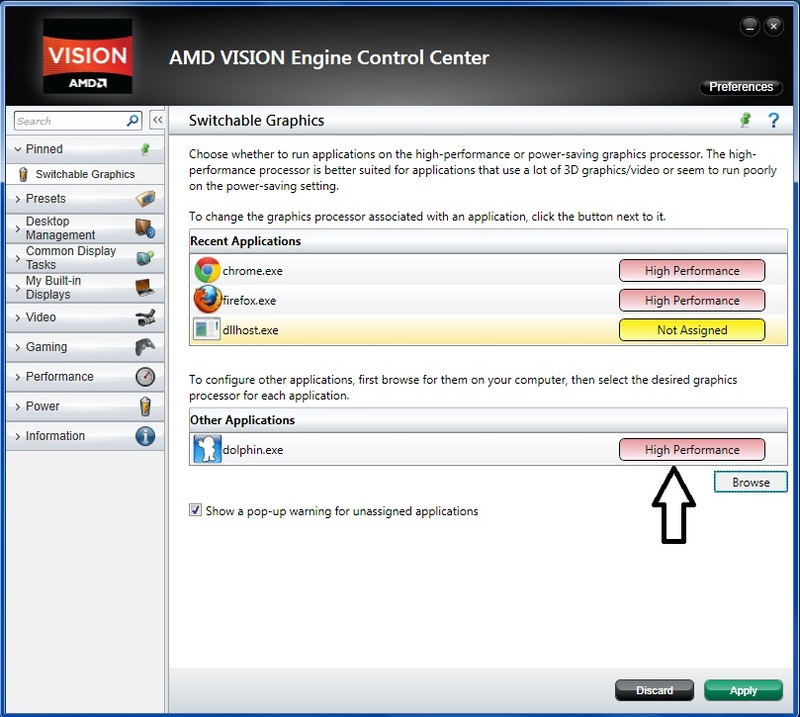 I'm using AMD system monitor to see if the AMD Radeon 7670m is being used. I tried Axxer method and it still didn't the card. However, I did see an improve ment. Download "GPU-Z" and check your "GPU Clock "
Oh yeah now I remember what is going on. Do what admin89 said AND what I said and see what happens. That is what other people reported as working (not guaranteed and unproven). Can I have a link to GPU-Z please? I googled it, but didn't find it.